Harold Willis Dodds, son of a professor of Bible studies at Grove City College in Pennsylvania, grew up in the company of teachers and students. After receiving his bachelor’s degree at Grove City and teaching public school for two years, he did graduate work in politics at Princeton and the University of Pennsylvania. During World War I he served in the U.S. Food Administration, afterwards becoming secretary of the National Municipal League. 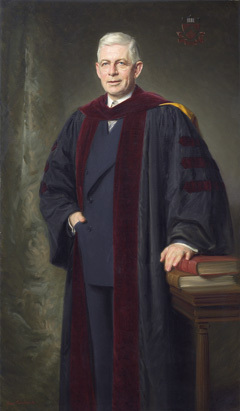 An expert in the problems of local government, with experience as a troubleshooter in Latin America, Dodds joined the Princeton faculty in 1925 as a professor of politics and was later appointed the first chair of the School of Public and International Affairs (now the Woodrow Wilson School of Public and International Affairs). He had been a leader in the establishment of the school, a cooperative enterprise of the history, politics, economics, and, later, sociology departments. The 200th anniversary of the founding of Princeton was celebrated over a two-year period (1946–47) with an almost continuous series of scholarly conferences and three major convocations. More than a thousand scholars and leaders from all over the world attended, including three presidents of the United States (present, past, and future): Truman, Hoover, and Eisenhower. As a continuing memorial of the anniversary, bicentennial preceptorships were established to enable promising young members of the faculty to spend a year in uninterrupted research. Despite wars and the Depression, Dodds doubled the size of the faculty, adding 30 endowed professorships. This permitted an increase in the size of the student body (graduate and undergraduate) by more than a thousand while maintaining the University’s distinctively high ratio of faculty to students. Music and the creative arts were introduced into the curriculum as well. The Office of Population Research was established, too. Three new departments were added: religion, aeronautical engineering, and Near Eastern studies. A new intellectual center for the University, Firestone Library, was opened in 1948 as a “laboratory for the humanities and social sciences.” In Princeton’s open stack tradition, it brought books and readers together with particular grace and efficiency. Not forgetting the constraints and uncertainties of the Depression years, Dodds felt the need for an additional, ongoing source of funds. Beginning in 1940, with his encouragement, Princeton alumni began to go out to their classmates each year seeking “unrestricted” funds for the University. Their first appeal netted $80,000 in cash. Their 16th appeal — the year Dodds retired — netted 16 times as much. Since then, annual giving has steadily increased. *Edward Dickinson Duffield served as acting president from 1932 to 1933.